"Crisis on Earth-Prime, Book Three: The Bomb-Blast Heard 'Round the World!" We're at the halfway point of Crisis on Earth-Prime! So far, so good... really looking forward to seeing this to it's conclusion. 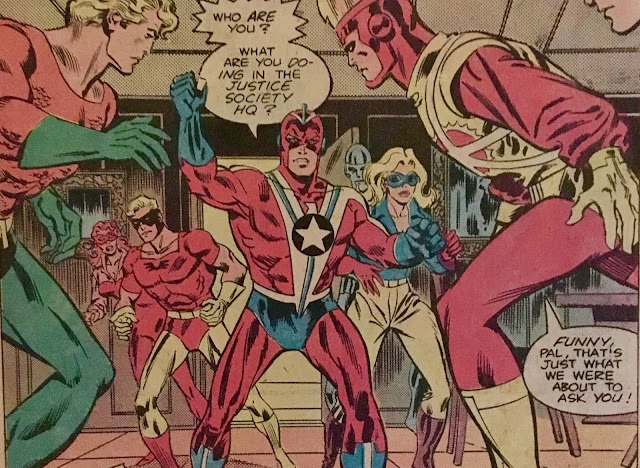 Picking up where we left off yesterday... and, heck... the day before that too, the All-Star Squadron and the Justice League are face to face at the old JSA Headquarters. 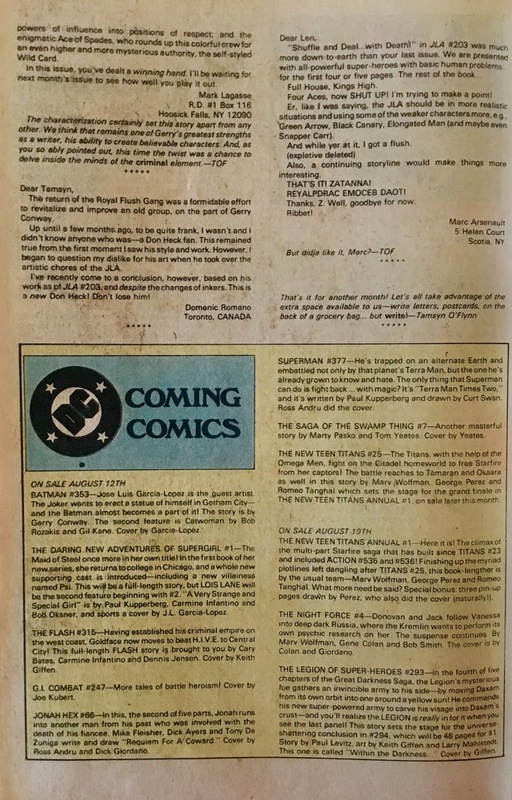 It's Earth-2, and the year is 1942. 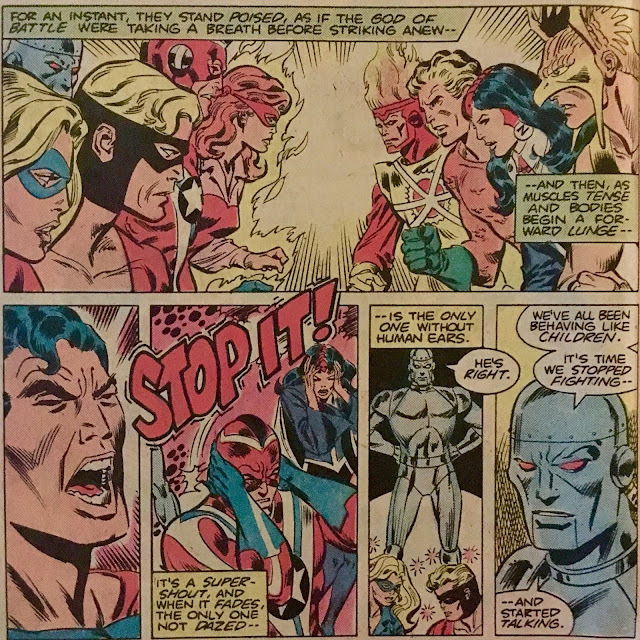 Since this is the first meeting between a couple of groups of heroes... they fight! 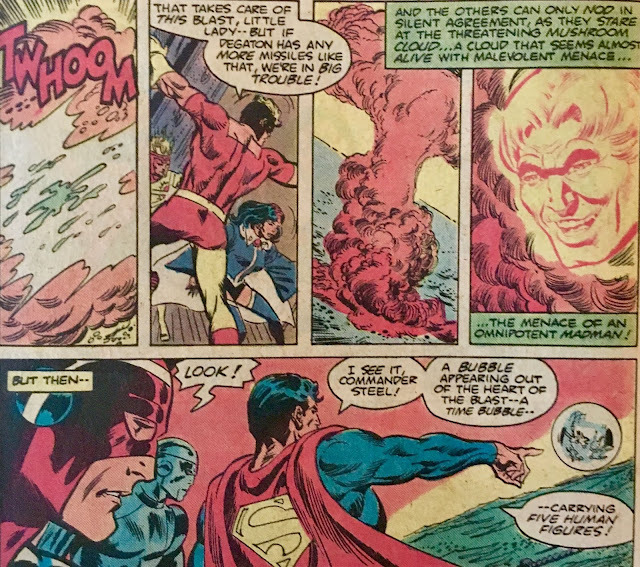 They find that they're pretty evenly matched... and the fisticuffs continues until Superman (looking like he'd gotten a botched facelift) super-shouts at them to settle down. 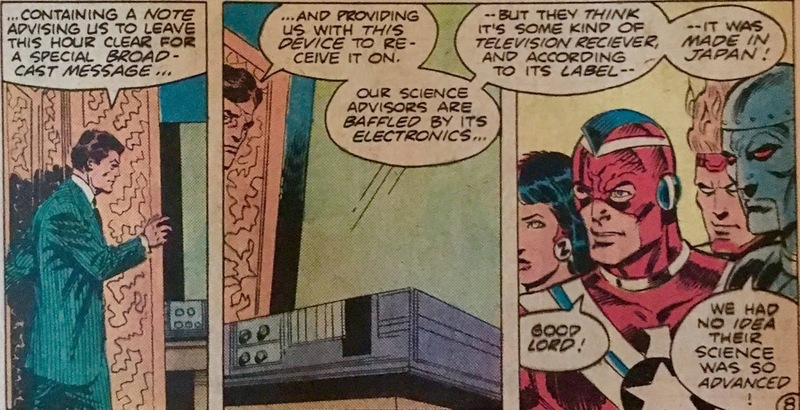 Robotman (not that Robotman), being... well, a robot... is unaffected by the super-shout, but agrees with the Man of Steel that, rather than beat the hell out of each other, they really ought to try and talk things out. Superman tells them about the future they come from... which, I always heard was a big no-no. Isn't that where time paradoxes come from? Ehh, what do I know? 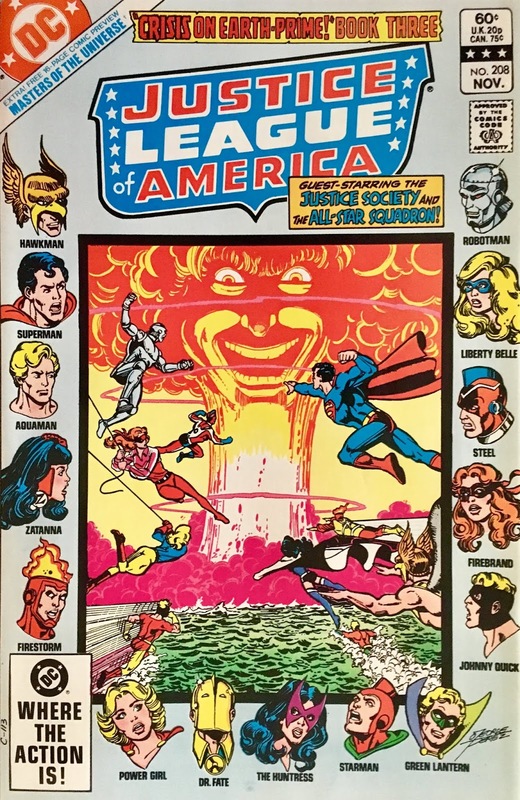 Anyhoo... he lays it all out for the All-Stars (and I'd assume at least a few of JLA's readers). Oh, and Firestorm flirts with Firebrand, even though she's drawn here to look like she could be his mother. Superman continues... and tells them about the future of Earth-2. 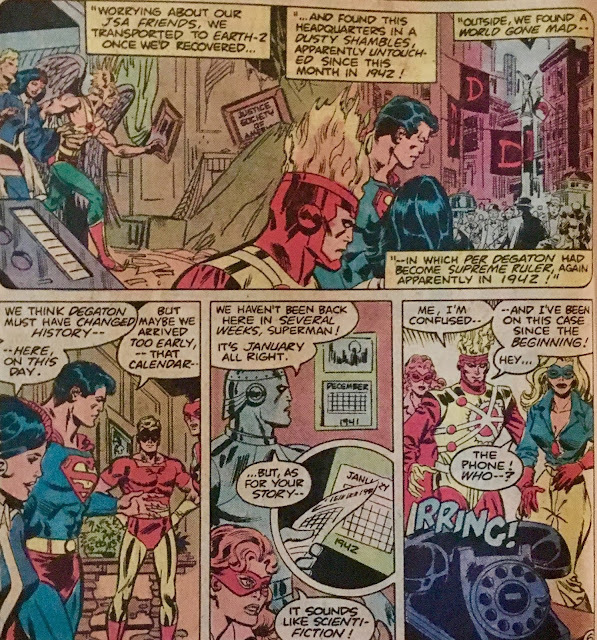 The Justice Society HQ in 1982 has been destroyed... and the streets are festooned (that's a word, right?) in reverence of the master... and ruler of the world, Per Degaton! Suddenly, a phone rings. Why, it's the President of the United States, Franklin Delano Roosevelt... and he'd really like to meet with the All-Stars because he'd received a very curious package. It's some hi-tech Japanese electronics, which baffles the U.S.'s science advisers. All world leaders have been informed to leave the coming hour of broadcast time clear for an important message. After flipping the switch, a video begins to play... it's Per Degaton, and he's talking to the entire world. 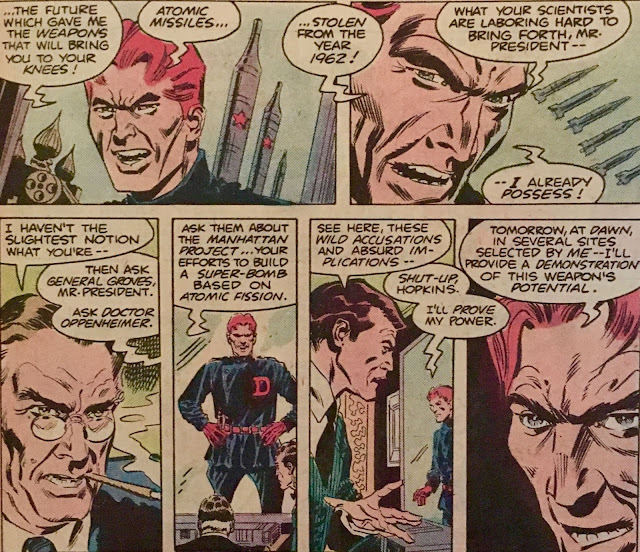 He introduces himself as the Earth's "future supreme ruler"... and, interestingly... he's addressing both the Ally and Axis powers... dude doesn't discriminate. Turns out the "video" is (somehow) two-way. He can hear and have exchanges with the heroes... which, is... I dunno, kinda weird... but, helps the story along. He threatens the world that he has enough nukes to basically end it all... and even mocks FDR for either being complicit in (or ignorant to) the Manhattan Project. In order to show that he means business, he's planning on giving a demonstration. As FDR plans his next move, we shift scenes over to Earth-Prime (1982). 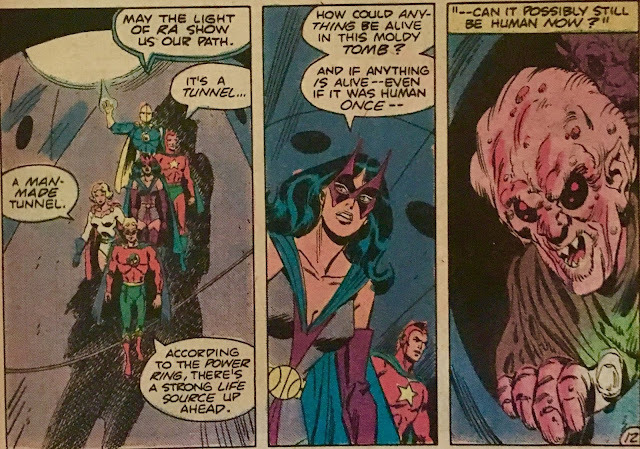 The Justice Society traverses the wasteland... questioning just how it all came to this. Alan ring-scans the area... and finally picks up some signs of life. They follow the "ping" to a ramshackle "cavern"... and it looks like they've found the Morlock Tunnels! The Morlocks freak the hell out and attack. They're very protective of their hidey-hole... and, rightly so. After a bit of a skirmish, Dr. Fate temporarily blinds the Prime-ers with a dazzling light... not before one of them mentions someone called "The Mad One" though. The heroes continue through the tunnels... and finally come across a man... a normal-looking man. He claims to be a Maintenance Engineer... who, as luck would have it, happened to be underground when the bombs went off. Dr. Fate tries to read his mind... and his thoughts are transferred onto a nearby television screen. It's John F. Kennedy, and he's talking about the Cuban Missile Crisis. We learn a bit more about what happened after the Crime Syndicate and Per Degaton stole the Earth-Prime nukes last issue. Both the United States and Soviets assumed the other side was playing them... the distrust grew into threats... and finally, to Kennedy... doin' that thing. Ya know... that red button thing. Apropos of nothing, it seems like leaving "the button" on the President's desk is kind of precarious, right? I dunno about you, but... I'm not sure I've ever met a button I didn't wanna press! That's too tempting for me! Once the button is pressed... the Soviets react in kind, and much of the Earth (Prime) is rendered a wasteland. Dr. Fate is very quickly (perhaps too quickly) able to deduce that Per Degaton was responsible for all of this. 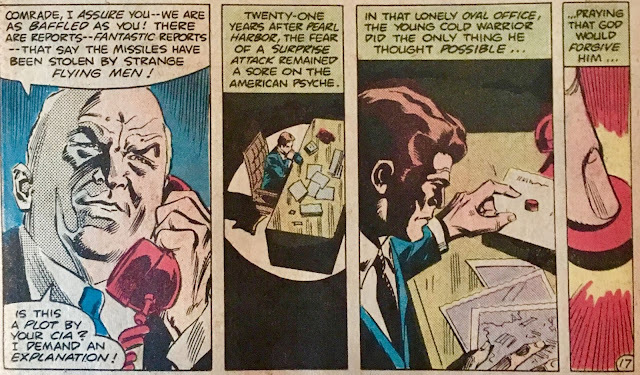 We hop back to Earth-2 (1942), and the eyes of the world are on Per Degaton. Both Allied and Axis powers are in position to watch his "demonstration". 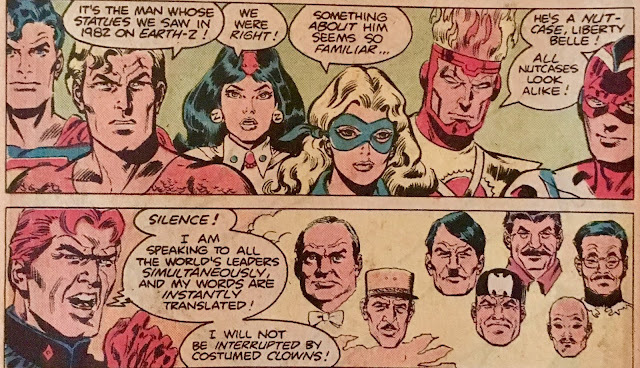 Superman is (rightly) bothered that Hitler is also there to watch... and wonders just what he (Hitler) would have done if he were able to get his hands on nukes. That's a very interesting question... and one I'm glad we don't have to answer! Then... Degaton fires off a single nuke, and... it explodes in the water! Zatanna whips up a spell to keep the blast (reasonably) contained. The All-Stars are shocked by the power of this bomb-blast... and are rightly freaked out at the idea that Degaton has a bunch more missiles just like it. 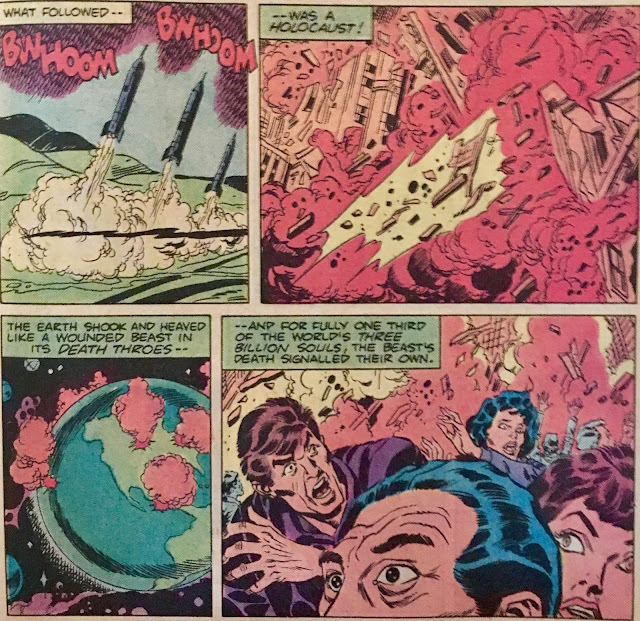 After the mushroom cloud dissipates, Superman spies an... emerald construct floating in the distance! It's (somehow) the Justice Society! The League and Squadron help their kayoed comrades. Meanwhile, Per Degaton and his Degateam look on from an overhead airplane. He's sure that everything is about to fall into place. The Allies are sure to surrender... and he's certain that the Axis won't be far behind. Now, never let it be said that you don't get your money's worth at the ol' Infinite Earths blog... because we've got us: a bonus book! We open with Metron Zodac riding the Cosmic Winds into Eternia. He is there to save a single life... a life which very well might bring (and keep) peace to Eternia. Though, he fears that he also might be damning them. I dunno about you... but, I'd err on the side of caution... maybe sit this one out. We hop inside Castle (Grayskull... I think?) where the Royal Court of Eternia is having a bit of a party. The King and Queen wonder where their son, Prince Adam might be. No sooner do they ask, than he saunters in with a "wench" on each arm. (A mustache-less) Man-At-Arms ribs him about only having two "wenches", and suggests he's lost his touch at "wenching". 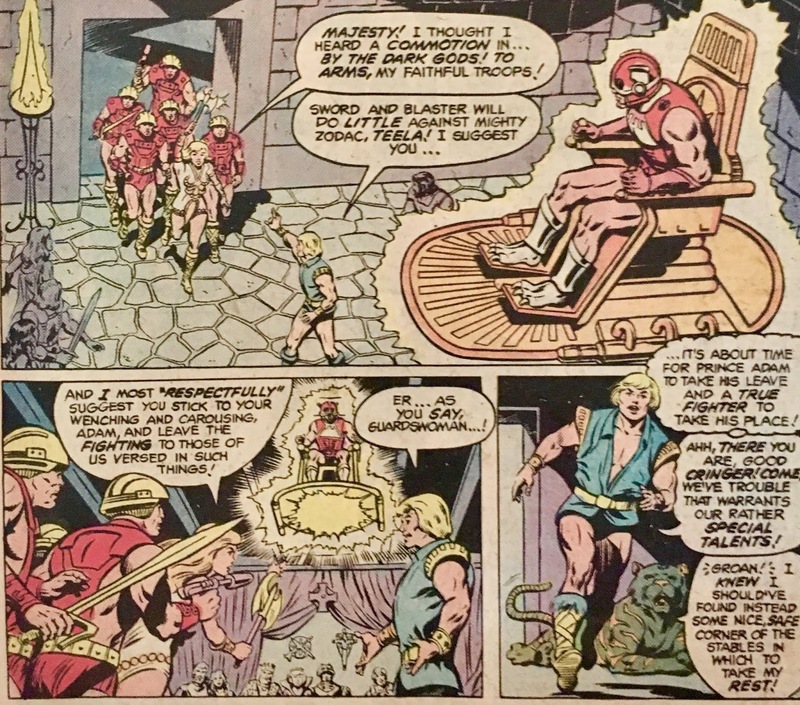 Suddenly, Zodac appears before them, with threats that Eternia's gonna go to pot, lest they produce their Greatest Champion. 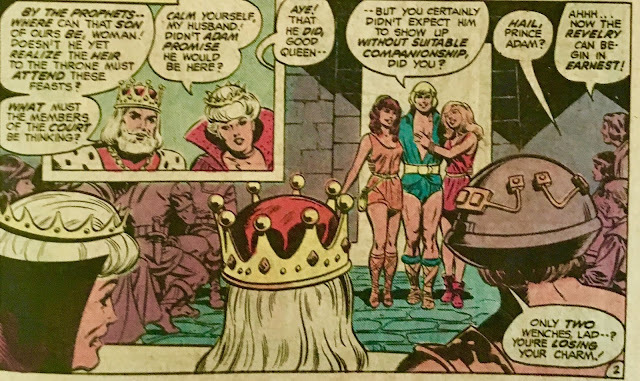 Prince Adam hears him out... then runs off (with Cringer) to "change clothes". He heads off to a cave... and (as He-Man... little disappointed we didn't get a scene of the change) chats up the Goddess. 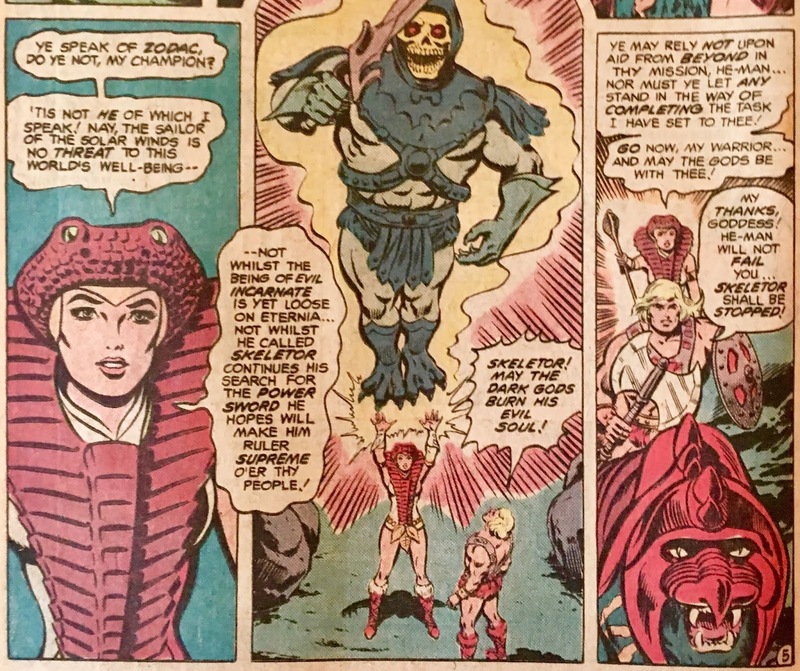 She tells him that Zodac isn't a threat... he instead needs to focus on, you guessed it, Skeletor. Duh. Double duh. Speaking of Skeletor... he, flanked by Beast-Man, is chatting up Mer-Man. 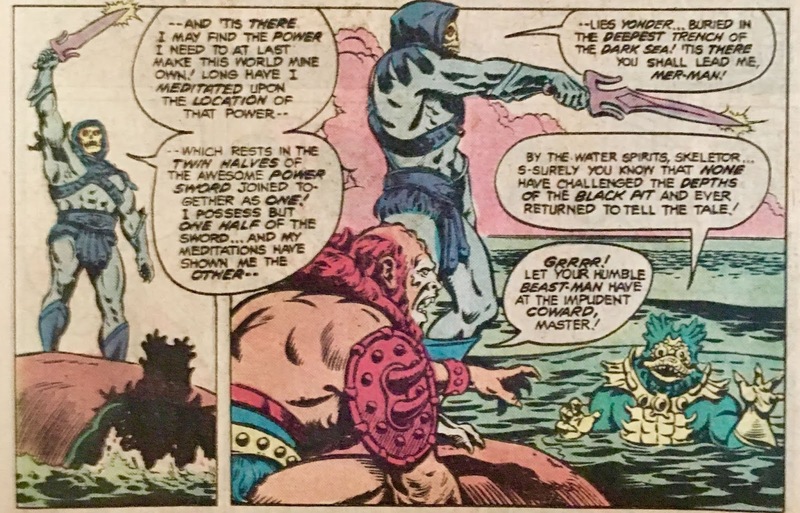 He asks the fishy fella to track down the other half of the Power Sword. Rumor has it, it's in the deepest trench of the dark sea. Fair enough. We shift scenes to... Metropolis? Well, that's unexpected. Superman is delivering a crate of valuable electronics to the mainland from a broken down freighter. He is suddenly attacked by a mustached octopus! Maybe he took Man-At-Arms' 'stache! 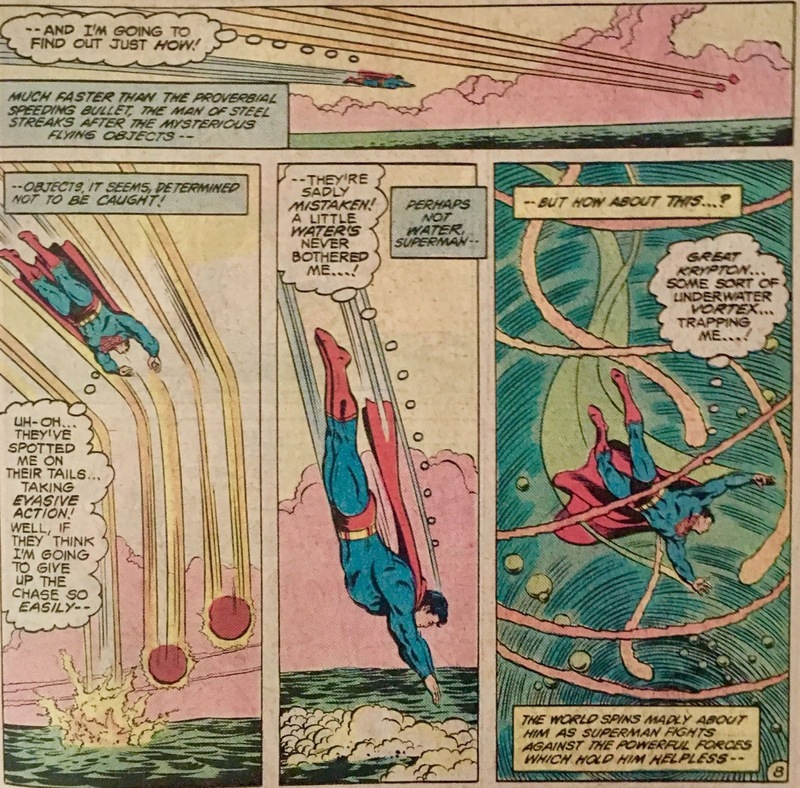 They struggle for a bit... but Superman is distracted by a trio of glowing balls flying overhead. He abandons the battle with the beastie to give chase. He follows them into the drink, and gets caught up in a vortex. Feels like we missed a few pages, doesn't it? 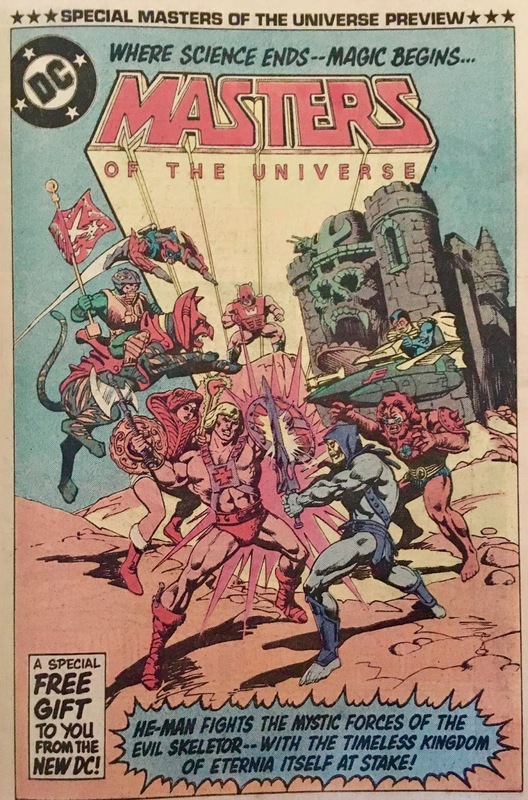 Back in Eternia, He-Man and Battle Cat meet Zodac. 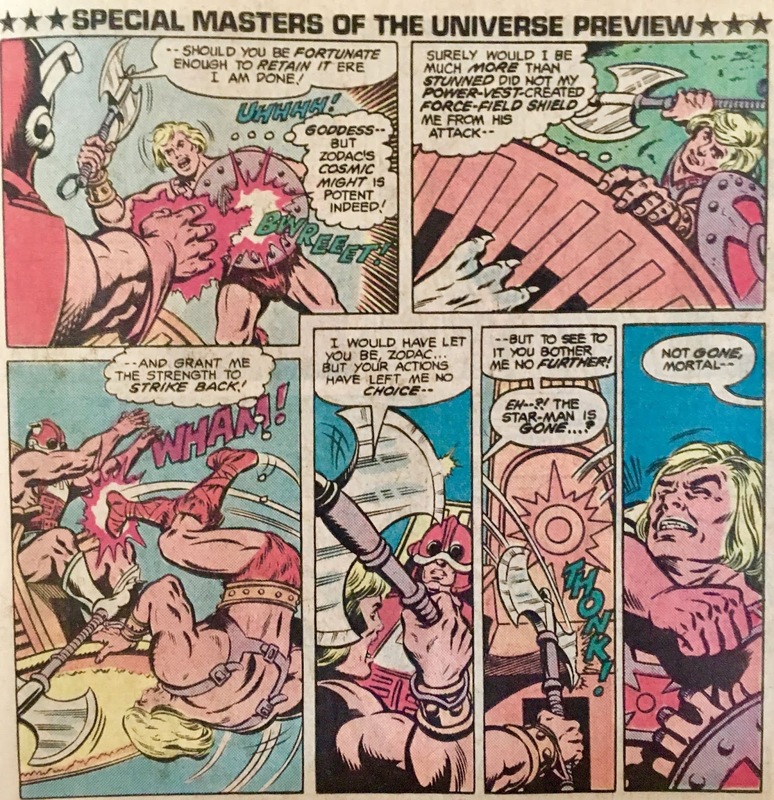 He-Man asks his cosmic visitor to stand down, as he has no quarrel with him. He's more interested in taking down Skeletor. While you'd figure Zodac would be all-in with this plan... he ain't! This, naturally... leads to a fight. 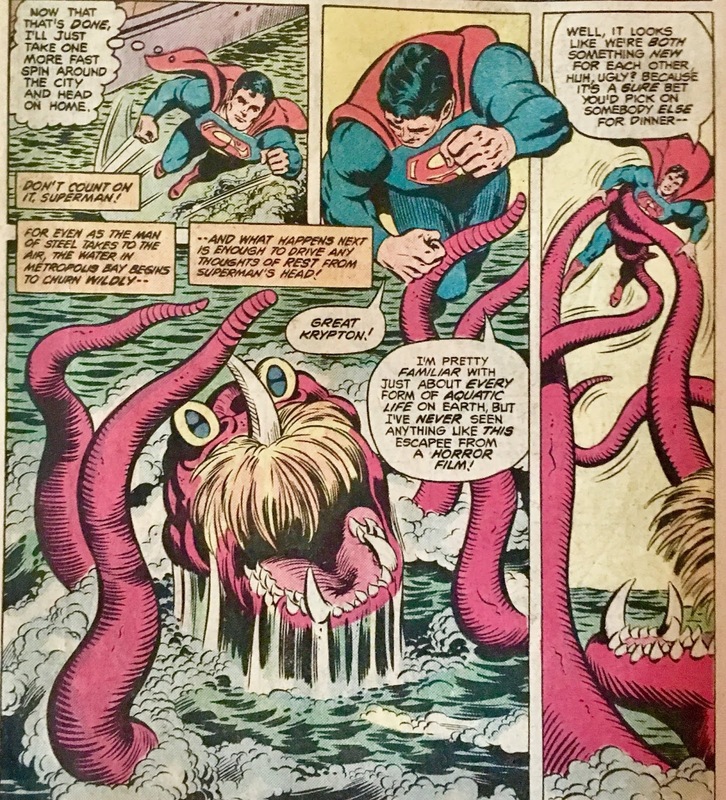 We rejoin Superman as he emerges from the water... only to find himself no longer on Earth, but in Eternia! There was a portal underwater, donchaknow. 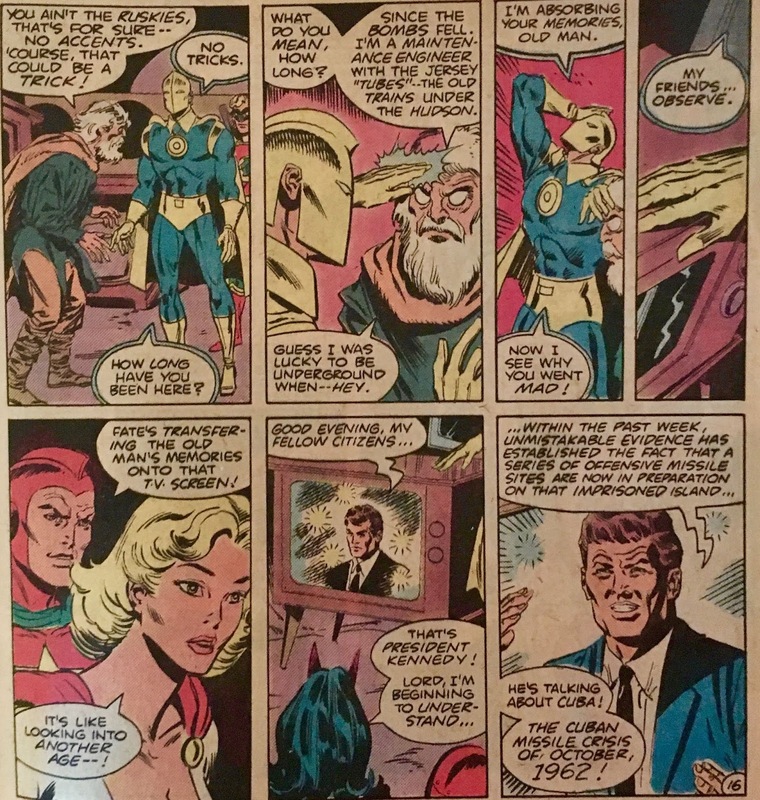 He recognizes it from the last time he visited (DC Comics Presents #47). He knows Skeletor is behind everything... which, c'mon... who else it gonna be? Speaking of Skeletor... he now has both halves of the Power Sword. Yeah... this definitely feels like it's missing a grip of pages. 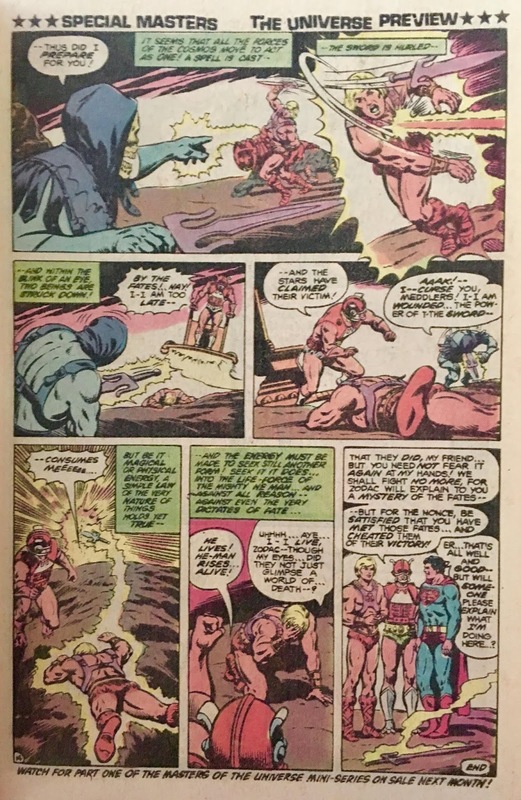 After pontificating a bit, he gives Beast-Man... what I can only describe as a "playful swat" on the tush with his Power Sword. 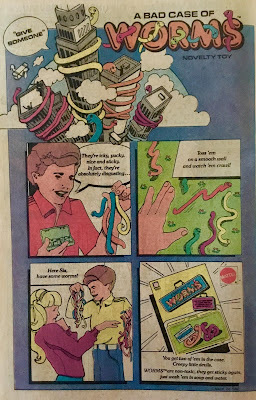 Superman than swoops in and steals'em both! Rather than just running (flying) away with them, Superman throws 'em... one returns directly to Skeletor, the other somehow finds its way to He-Man's back. This (somehow) ends the battle between he and Zodac. We learn that Zodac is only fighting He-Man to keep him from getting to Skeletor, because he'd seen in the stars that such a meeting would result in He-Man's demise. Undeterred, He-Man heads Skeletor-way. 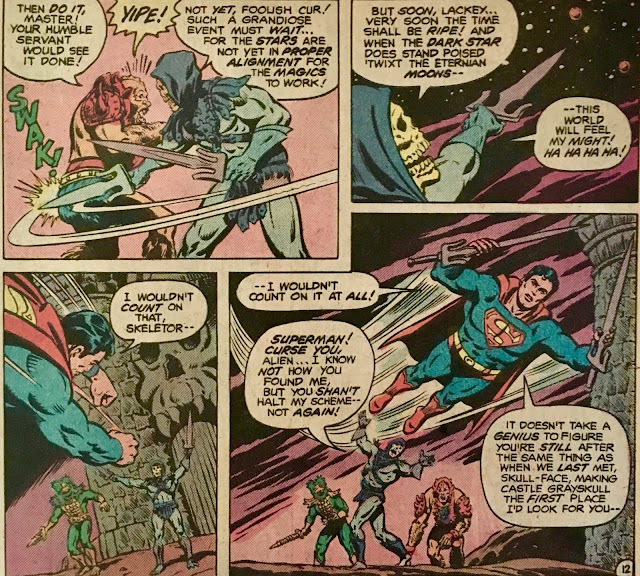 Upon arrival, he sees that Skull-face has already defeated Superman... and is about to go for the killing blow. 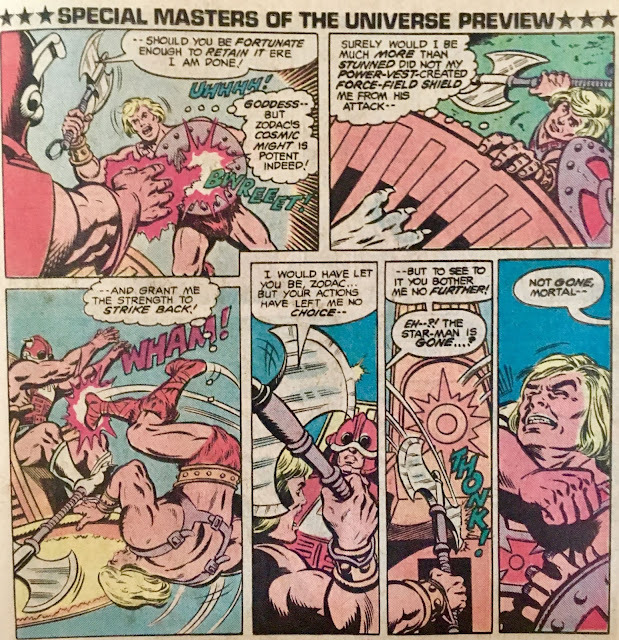 He-Man and Skeletor attack each other at the same time... with He-Man actually impaling the baddie with his half of the Power Blade. It manages to consume him... and sends him far away. 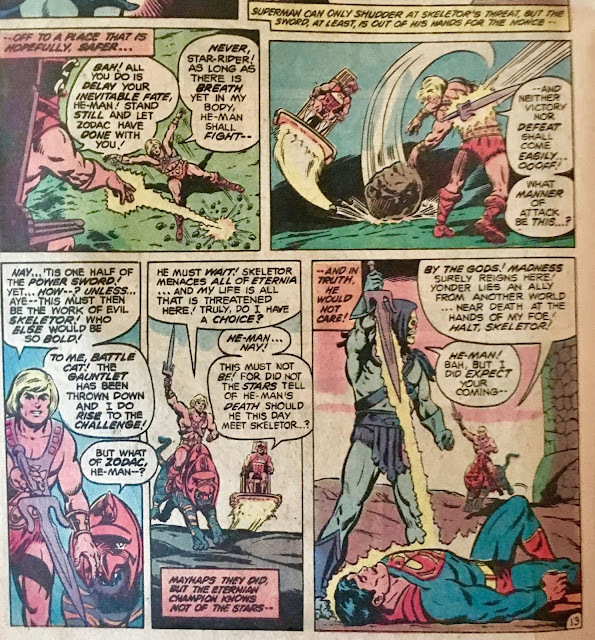 He-Man survives the blast he was hit with... and he, Superman, and Zodac celebrate their victory. Yay? Another jam-packed installment of Crisis on Earth-Prime. We did get the cliche hero vs. hero "misunderstanding" fight... but, at least it was short-lived. These days, that single scene could (and, in many cases, would) fill several issues. Here, though... a couple pages... and it works! There's a neat bit where Firebrand and Firestorm start a... duh... fire, and Zatanna whips up some rain clouds. This not only extinguishes the flames... but, it also empowers Aquaman. Really neat multitasking there! I liked seeing (Earth-1) Superman meeting Roosevelt. I think that's the sorta thing we take for granted these days. 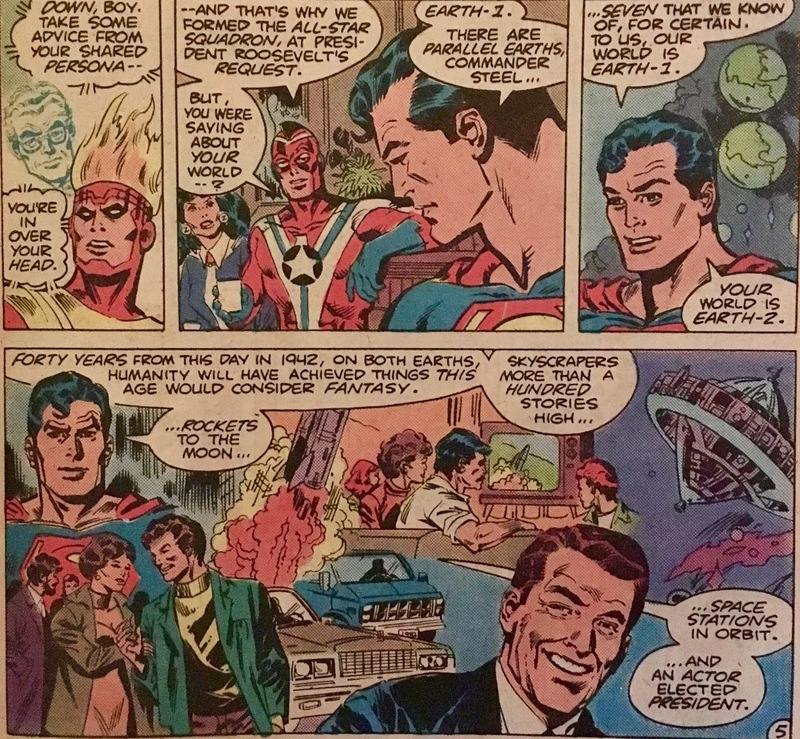 I mean, here's Superman, the greatest hero in the universe, meeting a man he'd only read about in history books. Regardless of your politics, being in the presence of someone who was so (pivotally) involved in American (and World) history, has gotta be somewhat staggering. Really cool stuff. There was a bit of "wonk" here, in Degaton's message being somehow interactive with the heroes. You gotta wonder, was it just with the heroes, or was he hearing everything that everybody was shouting at their television screens? Was it the super-duper advanced Japanese technology that facilitated it? Also... what did other viewers think when he was addressing people who weren't on the screen? Was the heroes' backtalk being broadcast as well?! There's also the bit with the League filling the All-Stars in on what's to come. I dunno... I kinda feel like that's "not allowed", ya know? Like... it's sorta cheating the "rules" of time-travel. There are rules to time-travel, right? 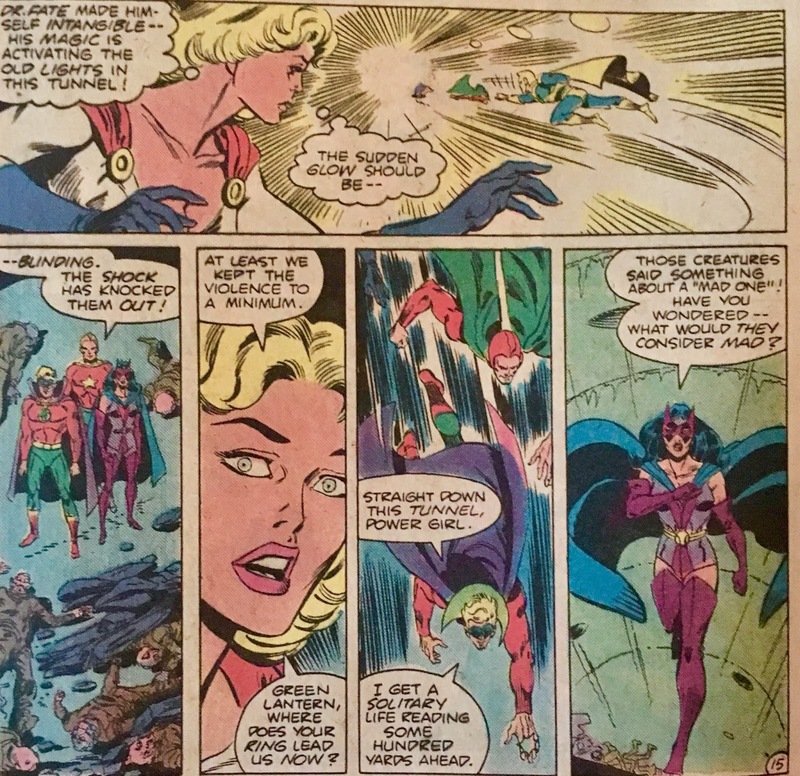 Another bit of "wonk"... the Justice Society just "appearing" after the bomb-blast, though, I'm assuming that'll be cleared up before long. I did enjoy their adventure on Earth-Prime (1982) though! Thought it was interesting to see JFK pressing the fabled nuclear button. Not something I was expecting to actually see on-panel! My main complaint about this issue (the feature, anyway), however, would probably fall to the art. It's just not all that dynamic... and we get some funky-looking faces. Also, perhaps the worst Reagan ever put to paper. I look at Ronald Reagan as having so many features that can be caricatured... seems like an easier real-life figure to draw... but here, he just looks like a dude with a businessman's haircut. 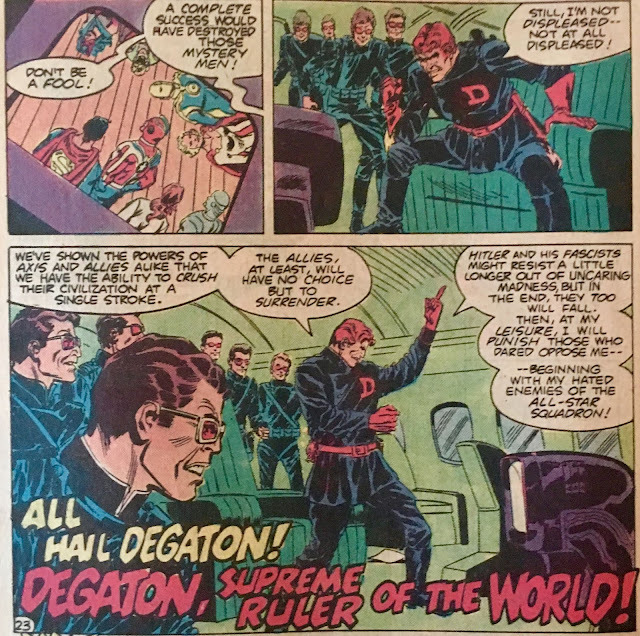 I really dig Degaton not taking sides in World War II... but, just being his own side. I like the idea that even the Axis powers are on this guy's list! Considering what we know about Earth-2 (1982) from earlier chapters... it looks like the world might just be about to bow to Per Degaton. Really fun stuff... really raises the stakes! 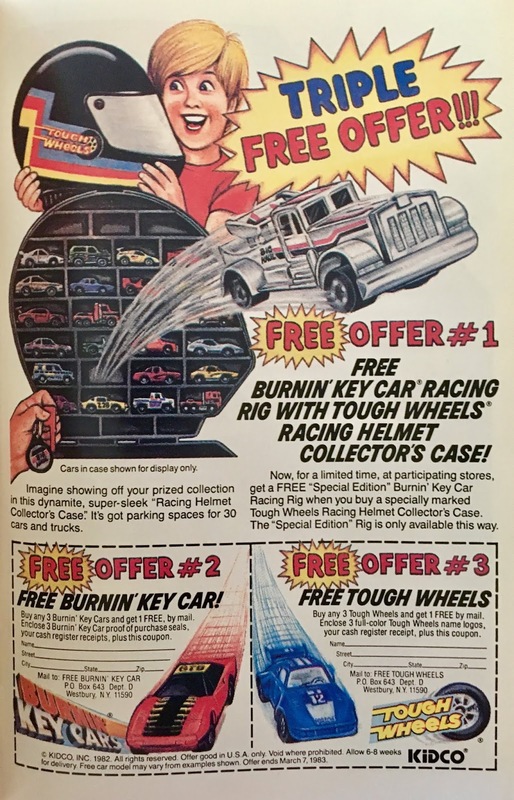 Then... there was the "Bonus Book". Can't lie, folks... didn't much care for this. 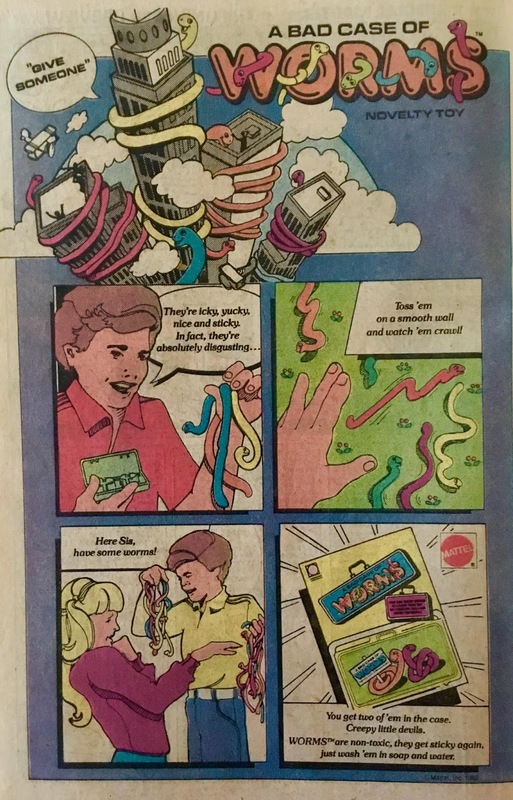 Outside of having a handful of the action figures, I didn't really get into He-Man as a kid. 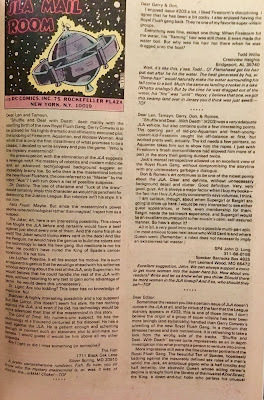 I'm sure I'd have dug this if I saw it back in 1982... keeping in mind, I was still a couple of years away from learning how to read at that point. Today? I dunno... it's just all over the place. Pacing was shoddy-at-best... we get panel after panel of pontification, either by Zodac or Skeletor while important actual occurrences are left out altogether. We always here that comics are about "showing, not telling"... but, that's certainly not what we get here. I mean, we waste so much time with monologues... and we don't even get the "By the Power of Grayskull..." scene? Lame. Tying Superman into the story? 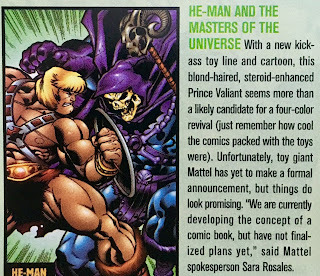 I guess it's neat to see him side-by-side with He-Man... but, his involvement didn't exactly rock my socks. Reading this makes me remember that weird time back around the turn of the century, where all of those 80's properties were coming back in style. 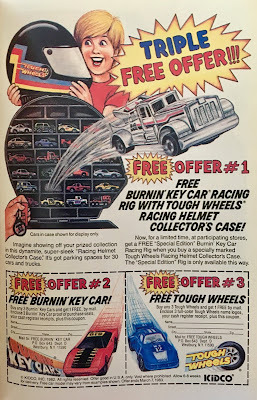 I remember sorta "buying in" to that fad, and quickly coming to the conclusion that... outside nostalgia, there just wasn't much there for me. 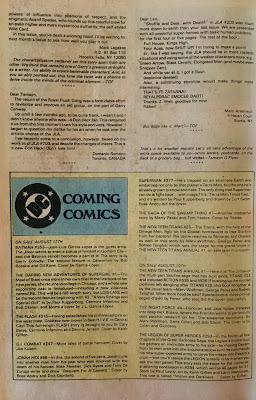 The folks at Wizard certainly did their part to foment the post-speculation speculation (above)... 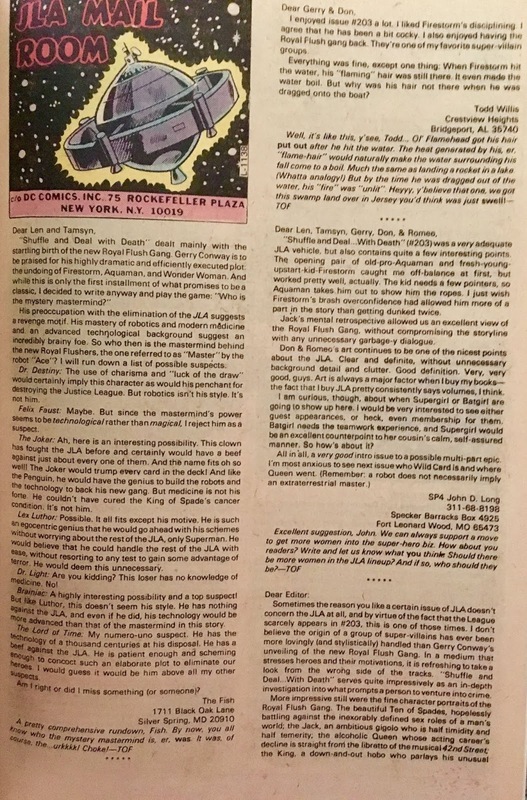 I even checked through several of their price guides to see if this issue of Justice League of America got a "bump" for having the Masters of the Universe bit. 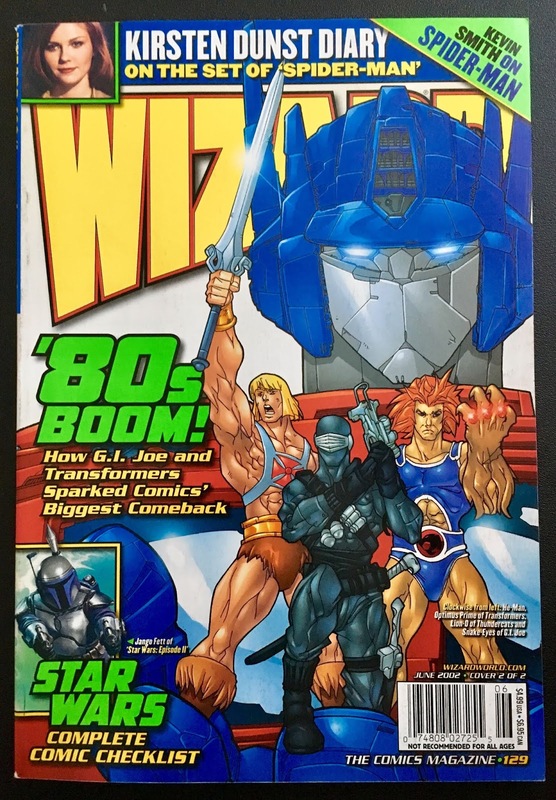 It didn't... but, that's not much of a surprise... the Wizard gang never seemed to give a rip about DC, unless Kevin Smith was writing something. Overall... another excellent chapter of Crisis on Earth-Prime, and... if you're a fan of He-Man and the Masters of the Universe... you're probably going to want this too (this story appears in several DC books cover-dated November, 1982). Won't break the bank in either case. It is available digitally... but I couldn't say whether or not the "Bonus Book" is included. It says "40 pages" on the link to the digital copy so I would assume the bonus book is included.